For taxpayers the Budget's fiscal projections are worrisome. The basic proposition from Alistair Darling and Yvette Cooper is that while the current economic turbulence will hit tax revenue and push up borrowing in the short-term, it's nothing that can't be contained within the existing fiscal rules. 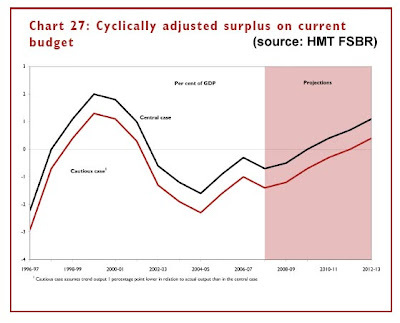 And by the time we get to 2011-12, a "mere" £4bn of tax increases (compared to Budget 2007) will be enough to rebalance the books. First, borrowing this year and next is substantially higher than forecast in last year's Budget- an extra £23bn, taking total borrowing to £81bn over the two years. Second, the Treasury's GDP forecast is more optimistic than the consensus. 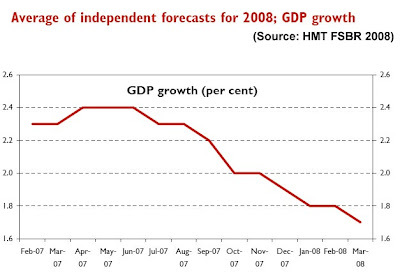 According to the Budget papers, the average independent growth forecast is now on 1.6% for 2008, and 1.8% for 2009. Against that, the Treasury is on 2% for 2008 and 2.5% for 2009. That may not sound much of a gap, but depending on whose ready reckoner you believe, it could mean an additional £10-15bn borrowing over the two years, taking total borrowing up towards £100bn. Given the innate caution of mainstream forecasters, and the unfolding US recession, who'd want to bet there's not more downward revision to come. Fourth, what happens if we don't revert back to 2.5% pa "trend" growth assumed by HMT for 2009-10 onwards? The way the banks have been zapped by the credit blow-out, that seems an extraordinarily optimistic assumption. If for example, we only got a jobless joyless 1.5% pa that would mean another c£10bn additional borrowing every year. In summary, the Treasury forecasts look far too optimistic. And as the TPA has pointed out many times, when it comes to optimistic forecasts of the public finances, this government has got serious form. 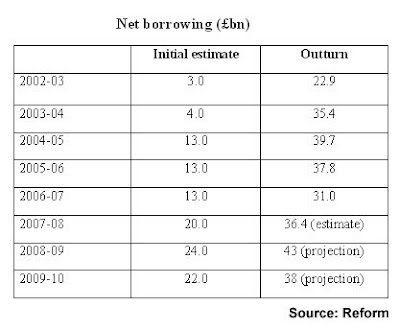 As we can see, in each of the last five years we've seen a borrowing outturn substantially higher than the initial government estimate- in one case, 9 times higher. One possible explanation is incompetent forecasting, but blind incompetence would surely have produced a random pattern of errors. Moreover this has been a period where growth has turned out stronger than most expected, so if anything, future borrowing should have been overestimated. No, these borrowing forecasts look to have been systematically massaged downwards throughout the entire period, and the massaging looks even worse in this Budget. This is both depressing and dangerous. How can taxpayers ever hope to engage in a proper discussion of the public finances without open and honest forecasts? Responsibility for public finance forecasts should be taken away from the Treasury. We need an independent Office of the Budget, modelled on the National Audit Office, and charged with producing non-partisan forecasts and analyses of public sector revenues, expenditure, borrowing, and debt. Other countries have that, and it's long overdue here.